The membrane is warping. Turbulence much greater than anticipated/remembered when entering at this vector. Signal lost. Endeavouring to recalibrate by coordinate 07A5θJ[first kiss stolen at sunset on the banks of the Wishkah]. Corrupt datum G59βL7[three ignored phone calls] interfering with navigation. Mission success remains uncertain. Previous contact/extraction/intervention unsuccessful. Overseeing/reviewing calculations for re-entry. Today saw my initial investigations into the object retrieved from the Tsu Chung-Chi crater. As I have already recorded, the object was brought in yesterday by a pair from the surveying team who are covering the southwest quadrant. Uncertain of its significance but recognising it as something unusual and of potential interest, they delivered it to me at base camp. 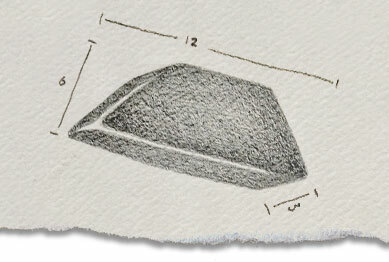 The object is a trapezoidal piece of reflective black material of roughly a foot in length, six inches in height and three deep. I was pleased to have something to occupy my time, even if it does turn out to be nothing more than space debris or, quite possibly, garbage from a previous expedition. Legally, someone of my expertise is required to accompany such surveys, but I have never before encountered anything on this barren orb which would make mining a particular location either morally or scientifically inadvisable. It is, as I have noted many a time, nothing but dust, dust, dust. We were approaching the station’s sleep cycle, so beyond noting its unusual reflective qualities I had little time to assess the object before retiring. It spent the ‘night’ in quarantine in the lab, waiting for me to confirm that it is safe to handle. I rose early to begin my work on the object. Tests showed it to emit no harmful radiation or immediately dangerous substances, so I brought it into the main part of the lab to investigate with my own, gloved hands rather than relying on the awkward, remote equipment. The object is solid with a certain malleable quality, giving slightly to the touch but returning quickly to its regular, smooth shape when released. The particular substance from which it is made is something of a mystery. As I had noticed before retiring, the flat surface refracts the light in strange ways. Looking into it, I see not the reflection of my own face, but half-illuminated shapes and whorls that shift in unpredictable directions as the perspective changes. The first real challenge came in the attempt to collect a sample for more detailed analysis. The unknown substance gives beneath my scalpel and will not be cut. Any marks left in it disappear as quickly as they do from a simple touch. A careful application of my laser-scalpel proved equally ineffectual, the substance diffusing and refracting the energy with no other effect. I abandoned the object, disappointed, planning to return to it if and when another approach occurs to me. Rotate about point 19A22Y[forgotten limerick found written in old birthday card]. Reference collapses. Membrane stretched to limit, distressed. Navigator plots emergency route to Σ7CBT9[view of summer sky through wine glass]. Path flickers, extinguishes. WE465Ω[stab of jealousy] collides with vessel. Lodestone wails protest. Vessel control lost. The object had lain in its container in the lab for a few days, not forgotten, but put aside until inspiration struck me as to what to do with it. I had begun to fear that any hope of such an eventuality had passed me by. Nothing had struck me this morning; bored and restless, I found myself tidying the lab, returning equipment to its drawers, organising my precious dust samples into their respective containers. I felt very isolated, with none of the survey teams due in for a dozen cycles or more. My eyes could have easily passed it by, but by chance they fell on the object. Immediately I noticed a startling change. Where the thing had previously been trapezoidal in shape it was now triangular, as if two of its sides had been extended until they came together in a point. I had not taken the object to be organic or mechanical in nature, merely a lump of some unknown material, so my surprise and excitement are not to be wondered at. Aimless tidying forgotten, I set to work on analysing the alien object afresh, only to be frustrated once more. I learned that it had increased not only in size, but also in mass. There was no evidence of it having absorbed any of the matter around it. I tentatively concluded that it had somehow reacted with the air of the room, lacking any other plausible alternative. Beyond these observances I could discover nothing new, and was thwarted in my further attempts to remove a sample for analysis. I fell into a stupor, staring at the intransigent object, not understanding how so apparently simple a thing could pose so many questions and offer so few answers. Where had it come from? Was it in some way animate? The creation of some alien intelligence perhaps? Or the intelligence itself? It was then, sitting idly and thinking – if I am to be honest – of very little at all, that I first became aware of a new phenomenon. I know that this is the place in my account where the doubt will begin, where I will be labelled as mad, or another victim of lunar isolation syndrome at best. But I am a scientist, and my duty is to the truth, no matter how strange or unlikely that truth may seem. I had been so intent on the object that I had not stopped to notice the effect it was having upon me. I am not used to describing such subjective phenomena, so I beg you to be patient with me. As I sat there I had the sensation of hearing a sound from very far away, like someone calling to me through the thick glass which separates the lab from the dead lunar landscape. The feeling was so strong that I looked all about me to find its source. I found nothing to account for it. However, on closer consideration I became aware that it was not a sound that was affecting me so. It was a feeling, a sensation, coming from far away as do half-remembered dreams that linger after waking. It was the warm feeling of seeing ones children after months of separation, distant but still so poignant and clear. The strength of this feeling disturbed me, for I have no family and certainly no children of my own. I shuddered, as someone on the edge of sleep, and the sensation departed. I sat longer, and another feeling came upon me, which seemed to me like the comfortable warmth that follows a meal well-eaten. I let this one fade on its own, as it did slowly, to be replaced by the sensation of relaxing in a bath. Many followed, laughter and joyful tears, afternoon strolls and dinner by candlelight, feelings of happiness and wellbeing wafting faintly about me until I felt to be some sort of beacon singing out the joy of humanity. A weak and ailing beacon perhaps, but a beacon nonetheless. The only thing I can attribute these sensations to, the only thing materially changed in my environment, is of course the object. Or madness. I have no feeling of lacking my mental faculties, of leaping to conclusions based on neither reason nor empirical evidence, so it offers no advantage to my studies to assume that my mind has failed. My waking hours have vanished quickly as I sat in contemplation of the sensations filtering through me, so I have taken myself off to bed, pausing only to note a slight rise in the temperature around the object. I noted it down, having detected no previous fluctuations in heat about the thing. I look forward to studying it more tomorrow. …Lodestone shifts. Membrane tenses. Hope. My sleep cycle was troubled by forgotten dreams of which I can only recall a sense of deep and confusing significance. I slept fitfully and rose early, eager to continue my study of the object. It was with a mixture of delight and fear that I found the thing changed once again. 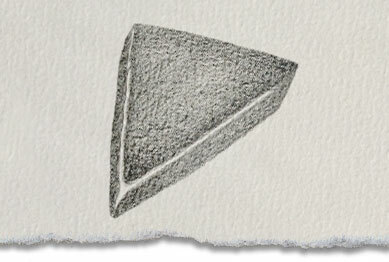 It was now a perfect, regular, three-sided pyramid, its base smaller than in its two previous incarnations. Its weight was marginally less than yesterday. The sensations struck me as soon as I entered the room, but with concentration I was able to relegate them to a general sense of wellbeing and thus continue my investigation unhindered. I began by studying the images reflected in its surface, looking for a pattern or something of significance. With a more discerning eye, I identified certain familiar symbols reflected within the object. As with the sensations, I feel as though I am viewing objects or scenes from a long way off and through frosted glass, but I cannot deny that there is something familiar about the shapes that lurk within the dark surface. Allowing for the limitations of my eyes and my inadequate equipment, I believe I detect subtle movement in these images, even when my head and eyes remain stationary. On a level of pure conjecture, it seems to me that the object has some sort of psychic quality, if you’ll excuse the term, some sort of remote effect on the human mind. The sensations I have been experiencing in its presence may be programmed into it if it is, as I suspect, the creation of man or some alien intelligence, or possibly they are channelled from another source or location via some property of the mysterious substance. The images within the surface may also be mental projections rather than any physical alteration in the reflected light. Viewing the object through a camera should be enough to prove or deny that latter hypothesis. As I watch the thing, it seems more and more to me that my suspicions are correct. 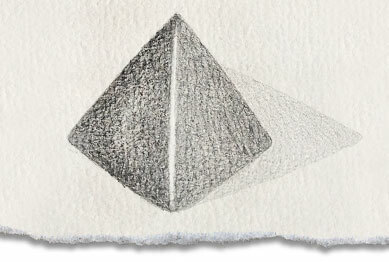 It may be my imagination, but there seems to be some indefinable connection between the sensations I receive and the images I perceive, as I sit here simply studying the pyramid. A part of me is distressed by the subjectivity of my investigations, but the object has resisted all physical means. When it is the mind that is being worked upon then the mind must lead the way, and feelings and intuitions become the signposts by which I must navigate. It is later than I expected, my waking hours devoured in contemplation of the object. I have formulated countless suspicions as to its function and purpose, but very little is confirmed. The next step in my investigation grows ever clearer to me, though it fills me with both excitement and dread. I have noted the remote effects of exposure to the object, the way it alters sensation and emotion. I have noticed that the effect increases with proximity, and from outside my laboratory I have not consciously experienced these effects at all. How much more would I be affected if I made physical contact with the object? The risk of harm to myself is minimal, I feel, but a risk nevertheless. But what is science without risk? Did Marie Curie die in pathetic regret or victory? I will not be afraid. I will make contact with the object. Lodestone straining. Beacon calls out from higher places, faint, stronger. Coordinate RQ99ΦR[faith when stepping into the unknown] ignites. Plane ? penetrated. Resume movement/direction/location. 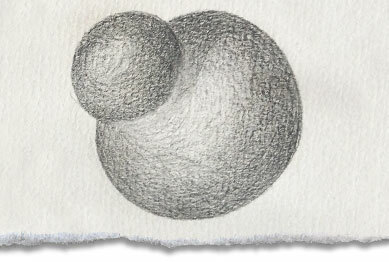 I returned to consciousness on the floor of my laboratory, the object, which now resembles a smaller and larger sphere fused together, clutched to my chest. I put it aside with no small reluctance. My neck was on fire where it had been bent against the floor, my stomach a cavern that growled with audible emptiness. But my mind – my mind was alight with things I cannot quite grasp. I understand much, and in the understanding begin to see how small my comprehensions are. By the clock I could see that three cycles had passed while my body lay abandoned upon the floor. My mind has wandered far, through eons and timeless arcs into the unknown. I now know that what I hypothesised is in a way true, though pathetically simplified and garbled like a story told to a child about impossibly complex things. I will explain my experiences as best I can. The experiences were overwhelming. A small part of my mind that remained separate enough from them for some kind of rational thought began to panic, afraid that it would dissolve within the torrent. It wrenched violently and tore itself away. If the signal could be said to have a location of sorts, it seemed to me that I was able to turn in the opposite direction, to move away from the information that threatened to overload my consciousness. I moved in a place where I saw faces, except that they were not faces and there was no sight. These were beings from higher places, and they explained/reminded me of many things, as much as they felt my psyche could assimilate without harm. They told me of a wreckage on the shores of reality, of a rescue attempt, of a previous failure in which, thrown off course by a faulty signal, they bounced off the moon long ago and left a certain crater familiar to me, and in that crater a beacon which they hoped might set them on the right path. All these things are true, but setting them to crude words makes lies of what I was taught. How is one to express the inexpressible? I look down at the object/artefact/beacon now, no longer wondering at its apparent change in appearance and mass, knowing that the technology of the higher places can only be seen one cross-section at a time. The beacon is set to collect the noble feelings of sentient races, for it is by these that the rescuers navigate like stars in the sky, and it was the broken darkness in our hearts that led them astray. For the phenomenal aspects of the human condition are thought flimsy and irrelevant in our reality, but in the higher places they have heft and weight. These are the building blocks of existence and it is by these that we will be found again. No evidence pointing to Doctor Manning’s whereabouts can be discovered. The three lunar suits kept at moon base 34c are present and accounted for. The area surrounding the base has been thoroughly scoured, and no concealed exits have been located. The doctor’s records have been archived and the object discovered in the Tsu Chung-Chi crater has been removed for further study. The case of Doctor Manning’s disappearance remains open. Follow this link to read more of Hugh’s fiction.